While runners are training over many months in preparation for the BMO Vancouver Marathon, an equal amount of effort goes into the preparation and hosting of race weekend. Like runners, we also prepare over many months and with teams to bring the event to life. In fact, over 100 volunteer teams and 4,000 volunteers log over 16,000 volunteer hours to prepare and welcome our nearly 17,000 runners. In addition to this incredible volunteer support, a volunteer Board of Directors and a small team of event professionals guide the event. Mission: Our mission is to deliver a marathon event that promotes Vancouver’s active lifestyle, engaging participants and community partners to create a positive and memorable experience. Vision: Our vision is to be the world’s best running experience, celebrating all that is Vancouver. As a volunteer-based organization, we do this because of the health, social and economic benefits that sport brings to the community. The Vancouver Marathon has been part of the fabric of the Canadian west coast community since 1972 providing opportunities for participation in the marathon, half marathon, 8 KM and kids events. In addition to the health benefits gained from participation, the event provides a positive social benefit to the community by engaging with citizens of all ages, abilities, religions, and cultural backgrounds in volunteer development. This engagement builds a positive community culture and creates a spirit of celebration. Economically, the spending by runners, spectators, supporters, sponsors, suppliers, exhibitors and other stakeholders generated $53.6 million in local GDP activity in 2013, as reported in the independent economic study by Dr. Brock Smith from the Peter B. Gustavson School of Business at the University of Victoria. As we look forward to another 40 years for the Society, sustainability in all areas is fundamental. As another pillar, continuous improvement and innovation are core values. To this end, each year we talk to many stakeholders and survey our runners, volunteers, exhibitors, and other supporters to obtain feedback. In fact, it was from this continued feedback that lead to the course re-design in 2012. Now, in 2014, with four separate races covering 72 kilometres of the city and parks, plus an exciting Health Sports & Lifestyle Expo, the event has garnered worldwide attention from runners and the media. Both CNN and Forbes have ranked this fine event as one of the top destination marathons right up there with the Boston Marathon, Paris Marathon, and the Great Wall of China Marathon. Wow! When a race is honoured on such a global scale, it is important to remember our purpose. We’ve come along way since 1972 with five laps around Stanley Park and 51 runners. Now with nearly 17,000 registered runners expected covering 72 kilometres in four events, and growing international attention, we remain committed to the development of the sport and the celebration of this great running city. With this commitment comes with great responsibility. We are forever grateful for the long-standing support of so many. In addition to our terrific volunteer support, we also rely on dozens and dozens of suppliers and stakeholders including Ambulance Services, Emergency Services, medical providers, logistical suppliers, traffic management services, and of course, the City of Vancouver including assistance from the Vancouver Police Department, Fire Department, Engineering, Sanitation, and Parks Board. In addition to the operational and logistical support of many organizations, we are also committed to fostering our elite runners and supporting many other charitable organizations. Over the years, we have supported and hosted hundreds of aspiring elite athletes in their pursuit of records and the advancement of sport. Equally important is our commitment to charitable organizations that engage with our runners to raise funds for important community causes, locally and internationally. Over the last decade, over $12 million has been raised for charitable causes. As a non-profit organization, our mandate is to achieve our mission and work toward our vision while investing in a safe and memorable race experience. The economic health of our organization is equally important for the long-term sustainability of the event. As such, we carefully manage our revenues and expenses to ensure they are deployed in the most effective and efficient manner. Our volunteer Finance Committee oversees the financial performance of the organization, while our volunteer Board of Directors carries the overall fiduciary responsibility of the organization. As runners ourselves, we want to ensure the experience is memorable and safe for all participants and stakeholders. We deploy the resources based on the forecasted revenue and that’s why we ask runners to register early. The sooner we can confirm our numbers the more accurate we can be in expense management. In 2013, funding for our organization was received from three sources: runner registration fees (69%), sponsorships (23%), and other revenue from the expo, souvenirs, photos, and other sources (8%). No government funding was received. 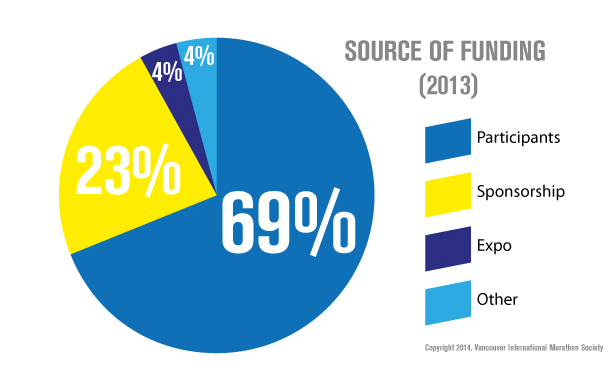 62% is invested into the race experience. These expenses include supplies like toilets, tents, water, safety cones, and course markers; traffic management plans and traffic personnel; transit plans and passes; medical and emergency personnel and equipment; volunteer training, shirts, and food; runner shirts, food, medals, bibs, and timing; city services like police officers, fire officials, sanitation services, and engineering support; elite athlete support and prizing; and course signs, sound, and entertainment. 17% covers our overhead such as warehousing, technology, insurance, accounting, legal, utilities, and our small events team. 14% covers race communications, including signage, e-newsletters, trade shows, social media, and our website. 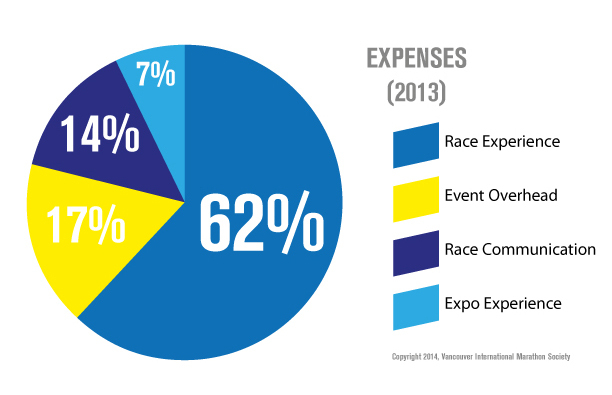 7% covers the expenses related to the Health, Sports and Lifestyle Expo. With your support, as runners, sponsors or other contributors, we are able to create and sustain a memorable and safe race experience. You have told us to build a world-class event, and it is our goal to continue to strive toward this goal. For us, as a non-profit organization, we are motivated differently. Our non-profit values ensure we remain focused on creating a sustainable event for the future with a balanced approach to both the top and bottom lines. We will continue to grow the sport of running, to improve health outcomes, to create a spirit of community celebration, to inspire volunteerism, and to share this great running city with others. This inclusive experience is what our founders envisioned and its what we continue to strive for today.